Source: I own two copies of this book, one in print and one in e-form. Ash had followed the rules very closely all her life, but when Keenan, the Summer King, sets his sights on her, all of those rules fall apart. As Ash, helped by her best friend Seth, attempts to sidestep the King at every turn, Keenan’s pursuit of her intensifies. He must find his queen and defeat the Winter Queen who holds all the power and is upsetting the balance. Melissa Marr has created a world that I instantly found myself transported to. The fae of her world are both charming and terrifying. They are mischievous and playful as well as cruel and powerful. To draw the eye of the King of Summer means the end of one’s human life as she knows it. For all his charm and good looks, it took me a while to warm to Keenan. The more I learned about him and his predicament, the more I sympathized with him and his situation. He really is a nice person at heart, with the best of intentions. He is used to getting his way, and isn’t sure what to make of Ash, who seems to thwart his every attempt to romance her. He comes to see it as a challenge, and a sign that she truly is meant to be the Summer Queen. Ash, who is used to trying to hiding her ability to see the faeries, is rightfully scared when she realizes all the precautions she’s taken are no longer working. She is my kind of heroine though—resourceful and smart. I appreciated how quickly Seth came to believe Ash’s assertions about the faeries living among them, despite his not being able to see them. While in other cases I might find it too convenient, in this instance, I felt it fitting. It spoke to Seth’s devotion to Ash. I most felt for Donia though, the human who had given her life to be with Keenan, only to be felled by the Winter Queen’s curse. Even above Ash, Seth, and Keenan, I found her to the most interesting character—and probably my favorite. There is a bit of mystery and power about her. She is the underdog who should not be underestimated. It is obvious from the start that Ash has a crush on Seth, and he on her, despite her protestations that they are just friends. If I had to complain about anything in the book, it would be that Ash ignored the signs as long as she did. For those who do not like love triangles (I rolled my eyes at the thought about this coming into play in this one too), I feel it is worth it to continue anyway. I really liked the way everything played out in the end in that regard. In case you get the impression this book is all romance, it is far from it. The struggle between the Summer King and the Winter Queen is quite intense, and Ash finds herself right in the middle of it all. It was hard to tear myself away from the book because I had to know how everything would play out. Wicked Lovely reads much like how I imagine Marr’s faery world—a dash of comedy, a dollop of romance, all swirled in with the darker elements. I loved the author’s imagery of winter and summer in their fae forms, especially when the Summer King and Winter Queen were around. I found this first book in the trilogy to be entertaining and thrilling. I look forward to reading the next book in the series. 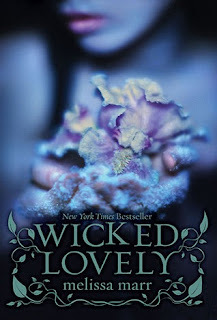 Thank you to all who voted for Wicked Lovely in my January TBR List Poll! To learn more about Melissa Marr and her work, please visit the author on the her website and onTwitter. This book has been sitting on my shelf for a long time and I've forgotten about it until I read your review. I'm glad to hear you enjoyed it, Wendy. Melody - I have had this one on my TBR shelf for quite a while too. I wish now I hadn't waited so long to read it! Hopefully you will like it if you read it. This isn't my kind of book but I know lots of people who would probably love it. Generally, this isn't my type of book either, but the "dash of comedy" appeals to me! I love fantasy and fairy tales, but don't always get along with the fae. Recently, though, I read Holly Black's The Cruel Prince which I thoroughly enjoyed. Jenclair - I want to read The Cruel Prince. I am glad you enjoyed that one. Oh I remember when this book was all over the blogosphere. It's not really my typical read but I love that cover! Glad you enjoyed it Wendy! Iliana - It was quite popular when it first came out, wasn't it? I read like the cover too! I remember reading this but it was so long ago that I've forgotten most of it. Your review makes me want to re-read! Verushka - This was my first by the author, and I definitely want to try more by her. Ash is a great character. I read this book long time ago and liked. Unfortunatel, the next book in the series didn't have the same effect so I dropped them. Lecture Read - That is too bad about the next book in the series. I saw it featured different characters and so didn't feel the rush to read it next. Thanks for the head's up! I love the cover and you make me think I might actually like it ! Stacy - It's a beautiful cover!